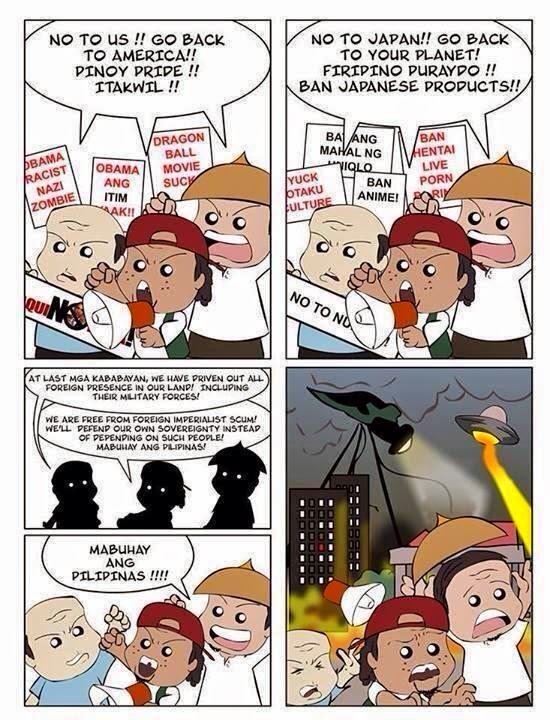 Well I feel like I want to write another satirical news for Toady Casino as of present because him and his Bobo Muna comrades are apparently in that whole stupid Pinoy pride or Pinoy superiority mentality as shown by the cartoon above. I was thinking of what I wrote against Anti-Americanism and other stuff of what fools Pinoys can be and why they should be differentiated from Filipinos just like Muricans from Americans. A Pinoy Pridist is somebody who's Filipino by blood and has a wrong sense of pride about his country and himself. And there's just some things that need to be brought up! This has brought to my attention especially that the 60/40 mandatory joint venture is just plain stupid rather than giving the option of 100% to joint venture for foreign firms under regulation of course or the fact that Loko Atienza wants to ban foreign drama to "protect" the Pinoy entertainment industry from what he calls as a "threat to their livelihood." When we take a look at anti-foreignism it's a culture of stupidity. As much as I reject colonial mentality (which allows bad imported products to come in), ethnocentrism also kills quality as much as its extreme counterpart. A closed economy brought economic ruin to a lot of countries like China during Mao Zedong's regime, Japan during the Tokugawa era and as of current North Korea, some South American countries and you could also name many African super underdeveloped countries worse than the Philippines. The Philippines is still livable because of foreign investment even under 60/40 or because of some Filipino businessmen that stand out but the hampering of progress is because of Pinoys. What Pinoys may purposely ignore is that even the name Philippines is named after King Philip of Spain. Also, many of the stuff they are using is foreign influence from the English language to computers to papers, to noodles, to use of sticky rice, to social media, to computers, etc. is not entirely Filipino but mixed with foreign influence. 300 years of Spanish occupation, the American Commonwealth, Chinese traders going in and out of the country, Imperial Japanese occupation, etc. created much of modern Filipino culture. For Pinoys to reject any foreign influence means they have to stop wearing Western-style clothes even if they were Philippine made, boycott Marikina shoes because the shoe design is obviously of Western influence, go back to writing in Alibata, speaking in Baybayin and not Tagalog, etc. as Chino Fernandez of Get Real Philippines pointed out in a similar article. If one can look at a primitive culture the nipa hut is not even purely Filipino nor is the indigenous dances- nipa huts also exist in places like Vietnam, Thailand, Taiwan and even China... it's very Asian and not just Filipino. If they are so patriotic and want to get rid of foreign culture, as I said, look for some island to start their new nation called the Pinoypines! 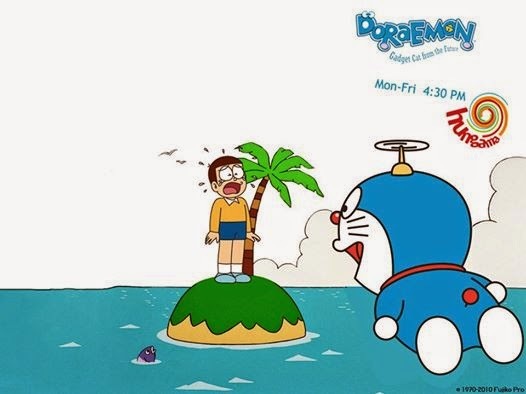 A bizarre aftermath after China obliterated the Philippines, only one island was left and President Nobita was crying that he lost his whole territory.